"Rabbi Shalva was warm, wise and compassionate ... We had a beautiful Jewish ceremony - one we will cherish for the rest of our lives." "Thank you so very much for making our wedding a beautiful and momentous occasion. We really appreciate that you took the time to get to know us within such a short time frame. Our family and friends gave us many compliments on our ceremony - which we attribute to you. That night will always be a cherished memory." - Lindsay & Adam H., Washington D.C.
"Rabbi Shalva provided inspiration and guidance that motivated our daughter to do her best work ... 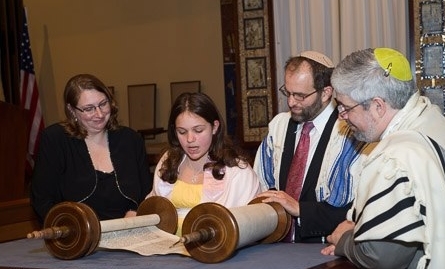 He conducted the Bat Mitzvah service with tremendous spirit and joy … In the days that followed, we received many favorable comments and compliments about the Rabbi and the services. The entire event exceeded our expectations." "Thank you so much for officiating at the funeral of my father. Your warmth and generous spirit shined through and was such a comfort to my entire family." "I want to write to say how grateful I am for the remarkable memorial service you led for my friend ... Everyone was talking about your eloquent remarks and how warm and caring you were. The service was very touching." Traditional davenning leadership for weekday, Shabbat and Holiday prayer services. Creative prayer leadership, incorporating instrumental music, song, parsha plays, meditation and movement. Guitar-based "Friday Night Live" services, ideal for all ages. Inspiring sermons and Torah discussions. "I just want to thank you for making our adult retreat such a wonderful experience. You brought a wonderful gentleness and presence to our time together, and it was very well received. Participants are asking how we can continue to develop this aspect of spiritual life ... that's surely a sign of positive and powerful impact. Kol Hakavod." I am a dynamic and energetic teacher of Jewish Studies, and have taught in synagogues, Hillels, youth group retreats, summer camps, and conferences. Sample class source sheet - Click Here. I will also tailor single-session or multi-session workshops for your synagogue, Hillel, camp, conference, or retreat. 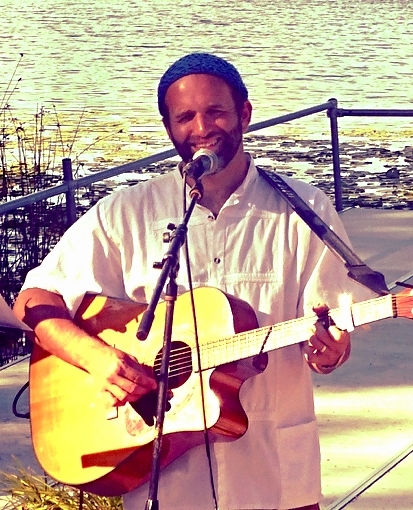 I write Torah-inspired folk songs and have performed them at synagogues, summer camps, Jewish learning conferences, and cabarets throughout the United States and Israel. I have also incorporated them into Torah study classes. All Music Recorded and Mixed by Peter Millrose at Millrose Music, NYC.